Although oceanographic modeling lags behind atmospheric modeling, recent advances in remote sensing, airborne observing systems, gliders, and other sensors have led to significant improvements in modeling the water column and ocean surface. Global scale wave models like Wave Watch 3 have improved in quality, while smaller scale circulation models now allow better resolution of conditions in small basins and domains. We are working with a selected group of partners in the oceanographic modeling industry to share data and create complementary product suites and now provide Wave Watch 3 model output through our various display services. 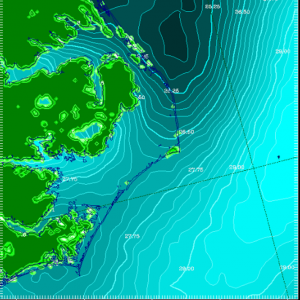 As with atmospheric models, WeatherFlow can also access and display any oceanographic model data that can be provided in an industry standard format.